Varna Free University “Chernorizets Hrabar” participate as project partner in “2018-1-CY01-KA203-046879 ENREAC-HEI ENhance REseArChers and HEI staff' skills and competences in data management and research integrity to increase academia collaboration capacity” project. In the period up to 2025, half of all jobs are projected to require high-level qualifications, but also entrepreneurial capacities, ability to manage complex information, think autonomously, use resources, communicate effectively and be resilient and flexible. As highlighted by ”ON A RENEWED EU AGENDA FOR HIGHER EDUCATION” E.C. COM(2017) 247 report “too many students graduate without the range of transversal skills (problem-solving, communication, etc.) they need for resilience in a changing world". The present proposal aim at developing and testing a set of MOOC courses on research skills and Open Science practices to offer HE, BA or MA students the possibility to increase skills and competences in research management, open research techniques, collaboration and team building abilities that HE and BA students need to me more efficient and effective at work, making them more desirable by the 21st century labour market. 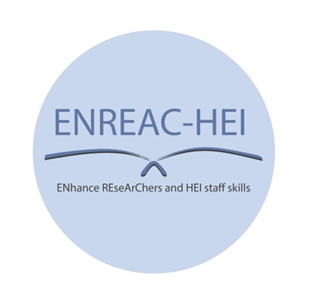 The innovative contents in the ENREAC-HEI program will enable HE students regardless of discipline, in acquire autonomy, critical thinking and the capacity for problem-solving to make them more efficient and effective at work, increasing their possibility for employment, succeed in their career and in general being all around citizens too. *Increase partners and HEI’s staff involved in the project knowledge on current OPEN SCIENCE practices and REASERCH skills aimed at strengthening EH students capacity for innovation, entrepreneurship and collaboration, within and outside academia. *Enlarge partners’ training offer by developing and testing the ENREAC-HEI blended modules courses and making it available for their HE, BA and MA students at local, regional and National Level. * Quality improvement of curricula in partner institutions through the development and testing of ENREAC-HEI's modular modular courses, making them available to students in bachelor and master programs at local, regional and national level. From 03.12.2018 to 04.12.2018 in Nicosia, Cyprus was held the first partnership meeting under the project “2018-1-CY01-KA203-046879 ENREAC-HEI ENhance REseArChers and HEI staff' skills and competences in data management and research integrity to increase academia collaboration capacity”. The meeting was attended by representatives of all partner organizations from Cyprus, Poland, Italy, Portugal and Bulgaria. The participants presented their organizations, expressed their expectations of the implementation of the project and discussed the activities envisaged for implementation. The commitments of each partner and the deadlines for implementing the activities were specified. The meeting started with a project review, project clarification and expected results, project administration, reporting, financial issues and project accountability documents. Then the partners discussed the management and implementation activities during the first year of the project, as well as the intellectual outcomes which have to be achieved during the period. The content, timing and division of responsibilities between the different partners were discussed in details. A plan for communication and dissemination of results - activities and responsibilities was presented.